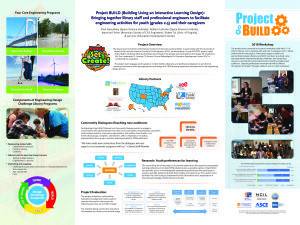 The Space Science Institute’s (SSI) National Center for Interactive Learning (NCIL), in partnership with the University of Virginia (UVA) and the American Society of Civil Engineers (ASCE), was awarded a grant from the National Science Foundation (NSF) to develop and implement a 3-year program, called Project BUILD (Building Using an Interactive Learning Design). The project will advance efforts of the Innovative Technology Experiences for Students and Teachers (ITEST) program at NSF. The primary ITEST goal is to better understand and promote practices that increase students’ motivations and capacities to pursue careers in fields of science, technology, engineering, or mathematics (STEM). 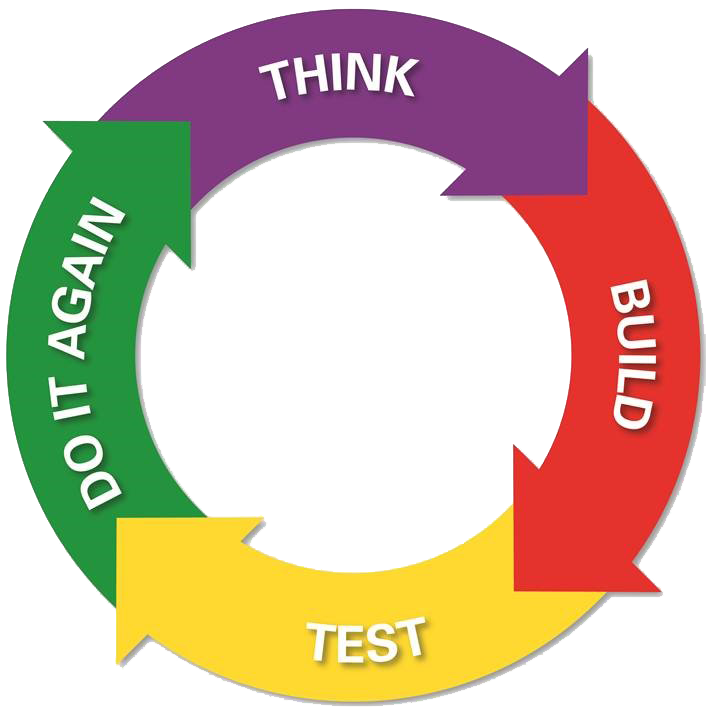 Learn more about ITEST projects and resources at the STEM Learning and Resource Center. 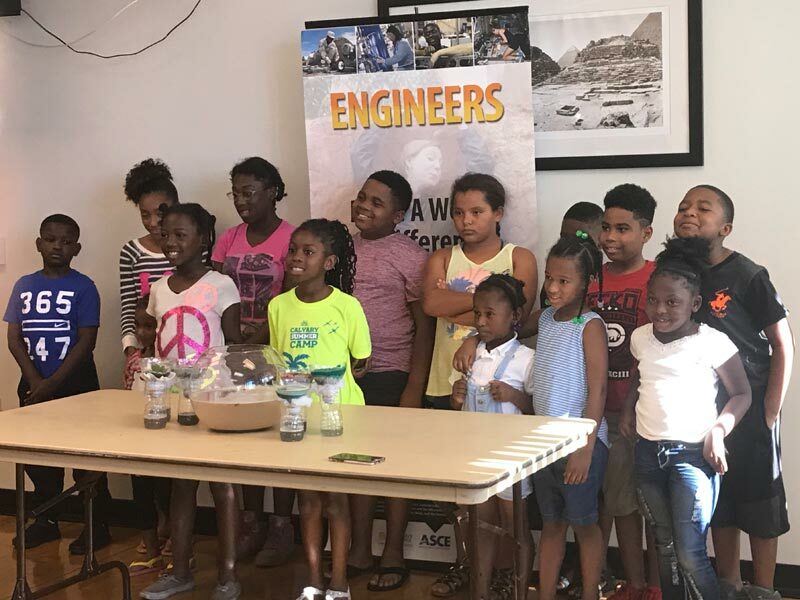 The project team engages youth (grades 2-5), their families, librarians, and professional engineers in an informal learning environment with age-appropriate, technology-rich STEM learning experiences fundamental to the Engineering Design Process. The overarching aim of Project BUILD is to better understand how youth’s learning preferences or dispositions relate to their STEM learning experiences. It also seeks to build community members’ capacity through Community Dialogues to inspire and educate youth about STEM careers. Project BUILD is part of NCIL’s ground-breaking STAR Library Network (STAR Net). Two libraries and their ASCE partners have been selected to serve as pilots: High Plains Library District (HPLD) in Colorado (with the ASCE North Colorado Branch) and the African-American Research Library and Cultural Center (AARLCC) in Florida (with the ASCE Miami-Dade Branch). An additional four library/ASCE pairs (2 urban and 2 rural) were selected early in 2018. They are:Anchorage Public Library and ASCE Alaska Section (Alaska), Cuyahoga County Public Library and ASCE Cleveland Branch (Ohio), Kanawha County Public Library and ASCE Charleston Branch (West Virginia), and Free Library of Philadelphia and ASCE Philadelphia Section (Pennsylvania). Below is a list of Project BUILD’s current libraries and ASCE partners. American Society of Civil Engineers (ASCE) represents more than 150,000 members of the civil engineering profession in 177 countries. Founded in 1852, ASCE is the nation’s oldest engineering society. ASCE stands at the forefront of a profession that plans, designs, constructs, and operates society’s economic and social engine – the built environment – while protecting and restoring the natural environment. ASCE is divided into geographic units that cover the entire U.S. Attracting youth to the profession is one of the ASCE’s top priorities. To this end, ASCE maintains a robust pre-college outreach program managed by Co-PI Jeannine Finton. It has an active volunteer network that matches engineers with needs at local schools and community organizations like public libraries, and supports them by providing training at annual Multi-Region Leadership Conferences and disseminating training videos and 100+ civil engineering outreach activities through the ASCE website. 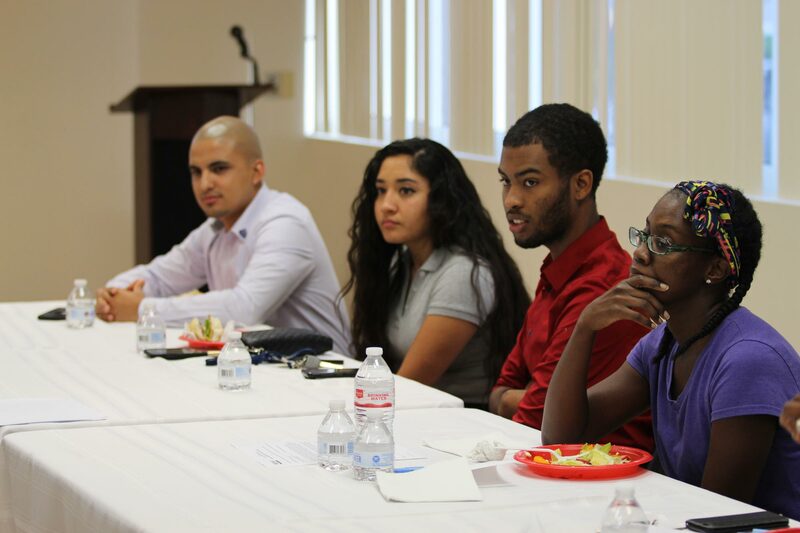 Participating Project BUILD libraries host Community Dialogue events to engage in conversations with representatives from their local communities, including ASCE volunteers, local business/industry, community organizations, Girl and Boy Scout leaders, 4-H, homeschool groups, caregivers, and teachers, with an emphasis on including representatives from groups currently underrepresented in STEM professions. Ready – Set – Create Learning Experiences are designed to help youth in grades 2-5: 1) Solve challenge-focused (real or simulated) problems using an engineering design process and 2) Use age-appropriate technology to model how engineers build a better world and improve the local community. Libraries have made STEM learning experiences available to patrons through a dedicated space called a Ready – Set – Create Learning Center. The space includes a banner, a table, and several bins that contain the activities. Regarding characteristics related to the youth’s preferences for learning, what common factors might identify youth who engage in project activities and what common factors might differentiate between youth who continue with program engagement and those who do not? What programmatic factors (i.e. design and composition of program activities, library recruitment, librarian engagement, professional engineer engagement, etc.) might influence youth’s initial and continued engagement in project activities as well as youth’s reported future career interests? The conceptual framework identifies seven different types of learning activities common in informal STEM education programs. 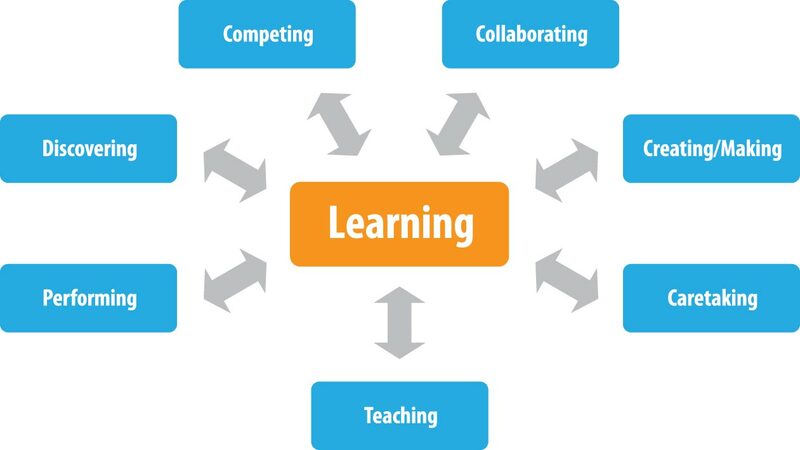 These seven learning activity types include: 1) collaborating, 2) competing, 3) discovering, 4) creating/making, 5) performing, 6) caretaking, and 7) teaching. See diagram below. 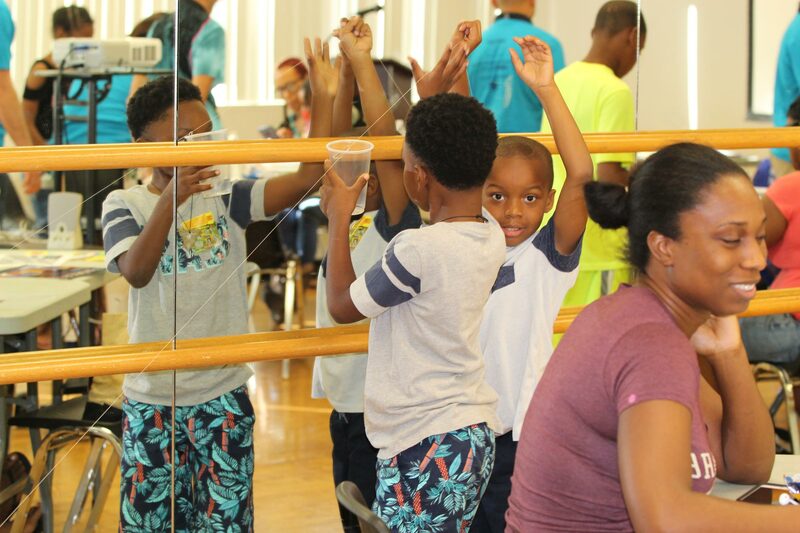 Program activities typically combine these seven types of learning activities to various degrees and our research has shown that youth have varying levels of preferences for engaging in these types of activities. The background research and survey validation and reliability have been established in prior work by Co-PI Tai. The survey has been pilot tested with students in Grades 2 – 12 and adjustments made to shorten and streamline the instrument for this program have been incorporated. The theory underlying our analysis is that youth with learning activity preferences will at times match with the program learning activity types and at other times will not. Our aim is to examine interaction between the learning activity preferences of youth and the learning activity types included in the library programs. The research questions target both this interaction and the potential influence of family members, librarians, and engineers engaging to various degrees at the various library partner sites. 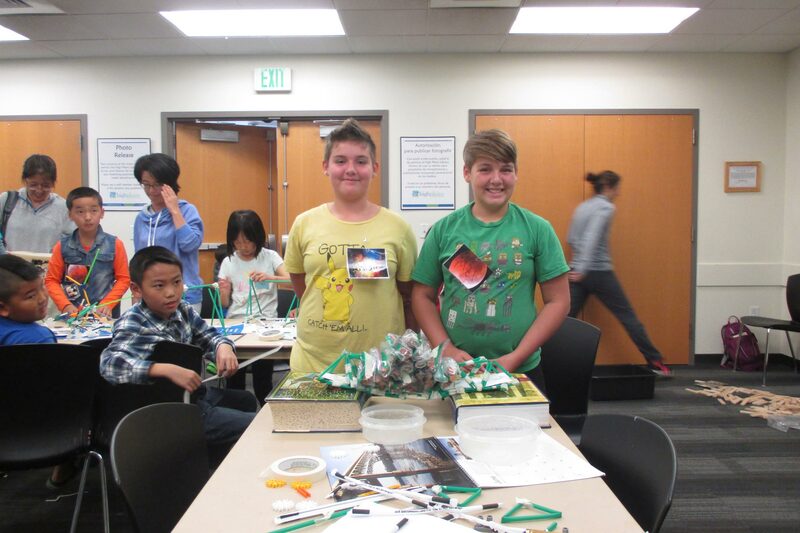 Project BUILD activities have been organized into four collections on the STEM Activity Clearinghouse. Each of these activities contains additional resources, including how-to videos, hints for use in a library setting, book suggestions, family guides, and more. Participating Project BUILD libraries receive training on these activities through instructional webinars from the Project BUILD leadership team. 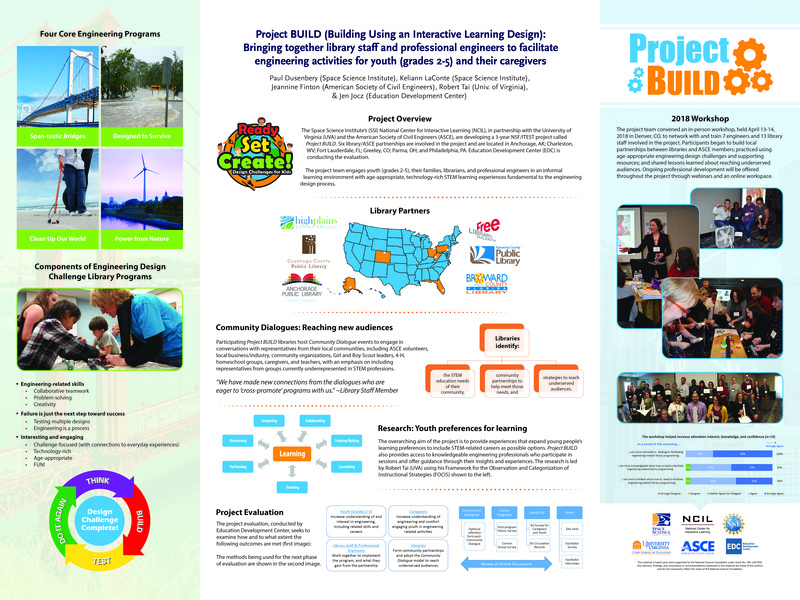 Project BUILD utilizes many resources, including activities, videos, and learning tools, from ASCE’s Dream Big project. Dream Big is a film for IMAX® and giant screen theaters that showcases the ingenuity needed to create engineering marvels as well as the compassion that drives engineers to create better lives for all. It aims to motivate a new generation of engineers and offers everyone the opportunity to experience engineering in a fresh and exciting way. Dream Big resources and programs include 50+ hands-on activities, girl-centered events, lesson plans, design challenge exhibits, videos and more. This material is based upon work supported by the National Science Foundation under Grant Number DRL-1657593. Any opinions, findings, and conclusions or recommendations expressed in this material are those of the authors and do not necessarily reflect the views of the National Science Foundation.